Simplified emarketing - built right in! Why would you want multiple systems? Act! offers the best CRM and emarketing all wrapped into one solution. Design professional looking templates right from the same window. Less to learn, more time to market. #3 Send and take action! As soon as you send your campaign, results start to stream in. A Real Time call list is generated right before your eyes. Those who have expressed interest will be placed at the top of the call list. Sign up for a free webinar and watch us make an email newsletter in minutes! Download the emarketing product brief. Act! 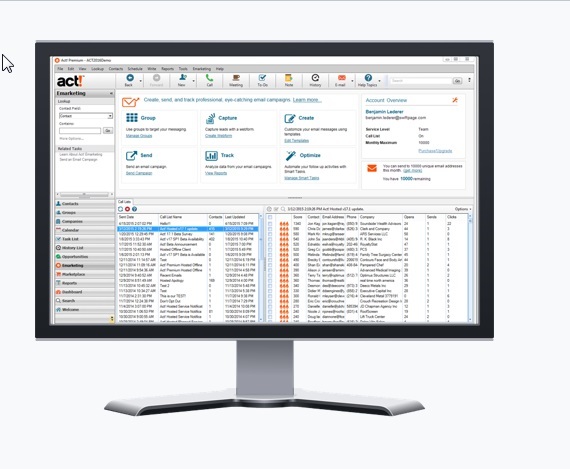 emarketing is available with Act! Essentials starting at only $10.00 per month. Act! Cloud Premium also includes emarketing starting at just $35.00 per month. Additional options as shown below. Be sure to contact us for monthly specials!